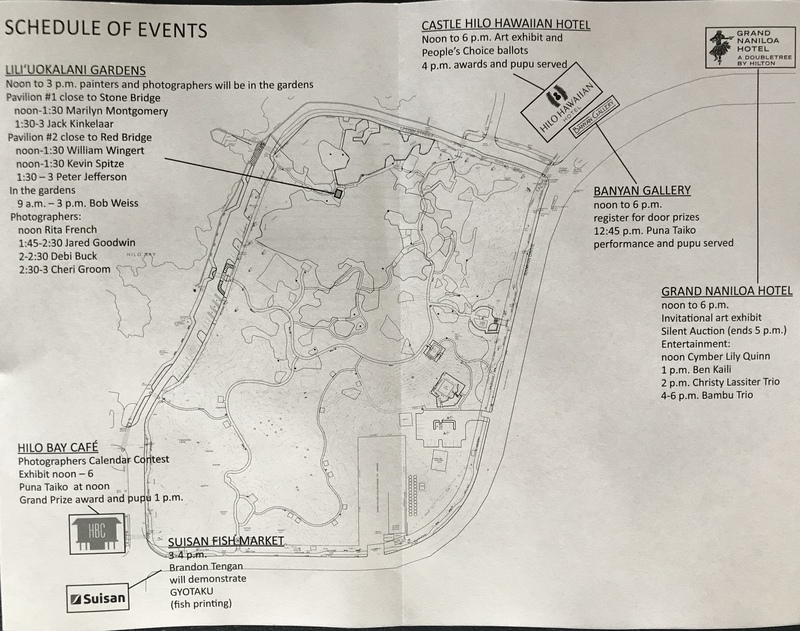 The second annual Banyan Drive Art Stroll features events at several locations in Makaoku, the old name for Waiakea peninsula. 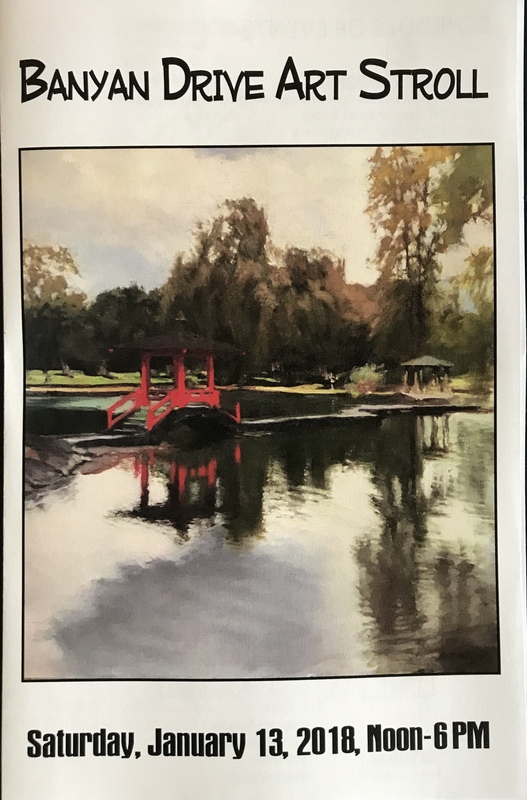 Featured on the cover of this year’s brochure/map/schedule is the award-winning work of William Wingert, a painter who will demonstrate from noon to 1:30 p.m. in Lili`uokalani Gardens in the square-roof pavilion close to the red bridge. 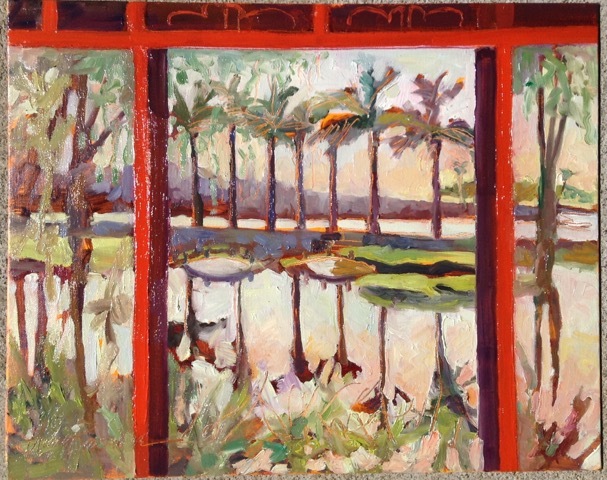 Wingert’s home is Hawaii Island where he lives and paints outdoors, and in his Kealakekua studio. 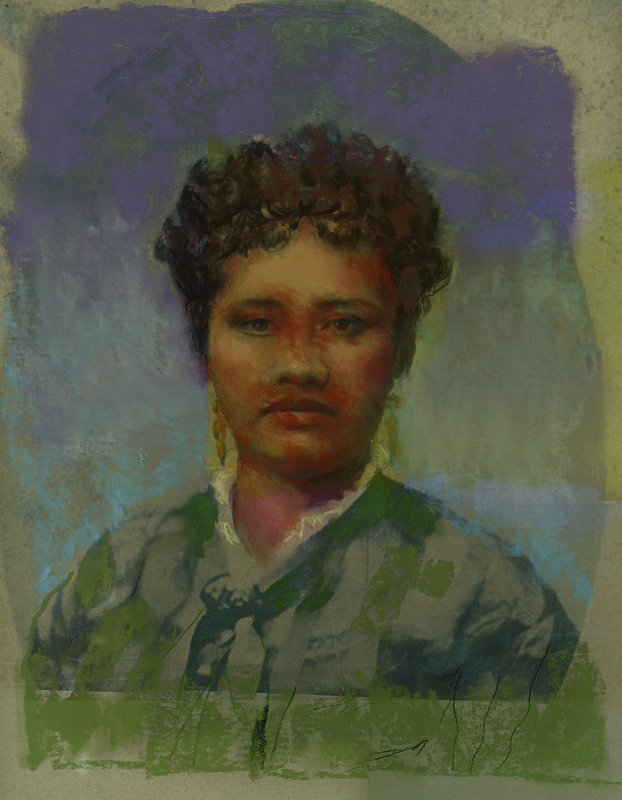 He also teaches painting at the Donkey Mill Art Center in Holualoa, along with an outdoor painting class in Waimea, and drawing and master copy workshops in his studio. Working in oils and charcoal, William produces landscape, portrait, and figurative work. Art on the theme of “The Beauty of Lili`uokalani Gradens” will be on display at the Castle Hilo Hawaiian Hotel and available for voting for the People’s Choice Award from noon to 6:00 p.m. Saturday, January 13. “This is a very competent collection of work,” Orwig said. “Judging is never easy. Any one of the entries could have been chosen for an award. What I have selected is based on the appeal of the subject matter, craftsmanship, and concept of the piece relative to the theme of the exhibit. “My first honorable mention is a photograph titled ‘The Path of Reflections’ by Jared Goodwin,” Orwig said. “It is a handsome piece and exhibits a clear perspective and a well-balanced composition.” Goodwin’s photograph also was selected by photographers contest judge Charles Wood as the grand prize winner in the calendar contest. Goodwin is among photographers who will give tours through the gardens. Meet him at 1:45 p.m. near the stone path featured in his award-winning image. Montgomery is among plein air painters who will be in the newly restored small shelter near the arched stone bridge. Her time slot is noon to 1:30. Retired now from editorial and advertising illustration, Montgomery worked some in the animation film industry. She says her last real job was as a digital imager and color specialist. Winners will receive gift certificates from Akamai Art Supply, Cunningham Gallery and Framing, and Ben Franklin. 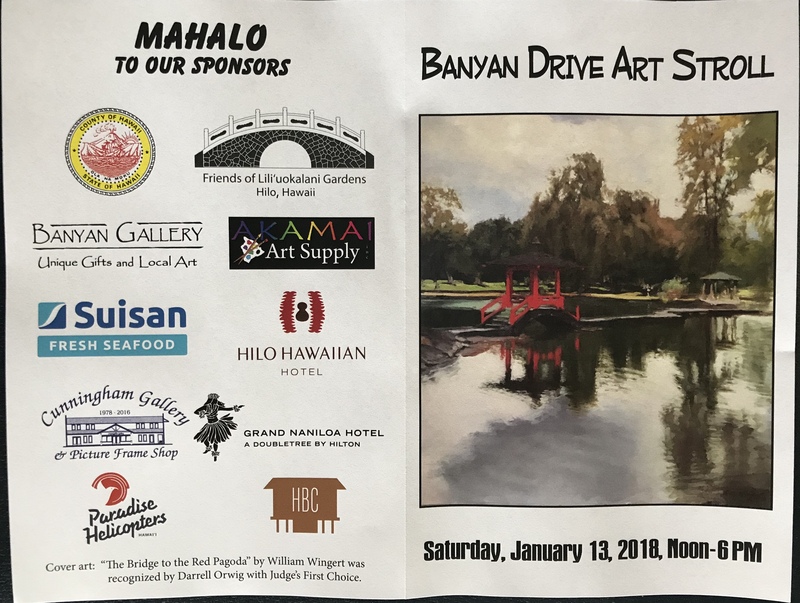 The Banyan Drive Art Stroll, set for Saturday, January 13, will hold events and exhibits throughout the Waiakea peninsula. Photographers whose images were selected for the second annual Friends of Lili`uokalani Gardens calendar will be on display at Hilo Bay Café with grand prize presentation by Paradise Helicopters at 1:00 p.m. Artists will demonstrate en plein air in Lili`uokalnai Gardens from 1 to 3 p.m. Brandon Tengan will demonstrate fish printing (gyotaku) at Suisan Fish Market at 3 p.m.
An invitational art exhibit and silent auction plus entertainment are scheduled for the Grand Naniloa lobby and lounge. Registration for door prizes will be at Banyan Gallery. Sponsors include Friends of Lili`uokalani Gardens, Banyan Gallery, Paradise Helicopters, Akamai Art Supply, Cunningham Gallery, Hilo Hawaiian Hotel, Grand Naniloa Hotel, Hilo Bay Café, the County of Hawaii Parks & Recreation Department and Suisan Fish Market. 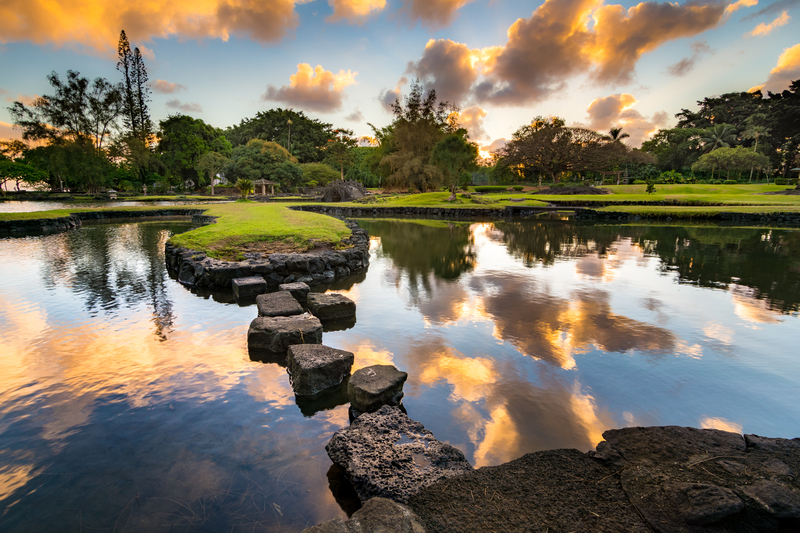 This is the first event of 2018 to continue celebrating the centennial of Lili`uokalani Gardens (2017-2019). For more information, see the Friends of Lili`uokalani Gardens Facebook page. Darrell Orwig retired from the Maui Arts and Cultural Center where he set up the Schaeffer International Gallery and was its director. He has juried many exhibitions on Maui, Kaua`I and Hawai`i Island. Orwig has a retrospective exhibit at Hui Noeau in 2011, a one-man exhibit at the East Hawaii Cultural Center in 2016, and participated in a group exhibit at the Wailoa Center in Fall 2017.